The OptoLyzer® MOCCA FD is a high-performance automotive bus interface supporting CAN FD, CAN and LIN developments. The tool can be applied in different phases of the automotive system/ECU development cycle, from prototyping and implementation to analysis and verification. CAN (Controller Area Network) has been an ISO standard for over 20 years. Increased bandwidth and payload length requirements have led to the development of the next generation of CAN: CAN Flexible Date Rate or CAN FD. 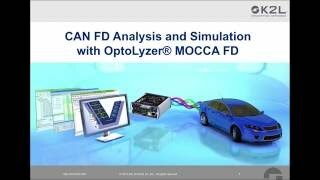 This video gives an overview on CAN FD and introduces the OptoLyzer® MOCCA FD hardware interface which is the right tool for all standard and specialized use cases during CAN FD developments (http://www.k2l.tools).